Wow! Last week was one extremely busy week! Besides being up at the school for Kindergarten Celebration, PTA stuff, inventory in the library, classroom ice cream parties, and Jesse's birthday and all that goes with it, I did lots of stamping and creating so I will have lots to show you this week! I'll start by showing you another teachers' gift project. They are all about the same with the exception of color combos and the card. Click here to see the first set. This is the set I did for Jesse's base school teacher. Jesse requested that I do her set in green (that's her favorite color). When the boy's make a request, I do my best to accommodate! 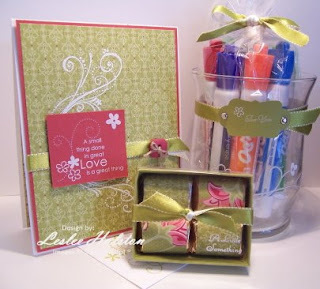 It worked out great...I was able to use up some of the retiring In-Colors and Designer Series papers. For this set, I used Kiwi Kiss, Rose Red and Whisper White. 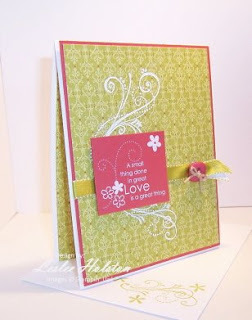 The DSP is Raspberry Tart (which I found difficult to use on cards - love it in this set though!). Again, I used the Love & Happiness Rub-ons (long retired). The Kiwi Kiss/Very Vanilla satin ribbon is lovely! I hated to use it (yes, I'm a ribbon hoarder too) but it was perfect for this project. The card was quick and simple. The sentiment is a rub-on. The flourish is embossed using white embossing powder and the Priceless set. Don't be afraid to stamp right onto the designer paper. It really looks great! Check out the button treatment. I've thread the satin ribbon up through the slot punched in the card stock. The linen thread is then around the ribbon and thread through the button, holding it all together. I love this simple treatment! I know that Jess was excited to give Mrs. Hays her gift and he said that she really liked it. He really enjoyed school this year. 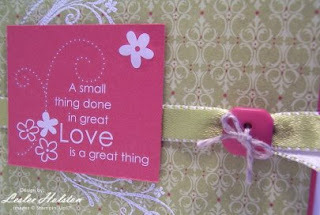 And that's important! Teachers are given a gift from God. And when one touches your life, it will change you for a lifetime! Thank you to all the teachers out there! You are super!!! Check back tomorrow with the last teachers' gift project. Adam forgot to take it with him to school today (okay...I forgot to hand it to him as we were running out the door for the bus). Tomorrow is the last day of school! Yay! May you find inspiration everywhere!